The SLIs you define must be specific to your service users’ experience. Your SLIs should prompt your SLOs and inform your Service Level Agreement (SLA). Read the Google Site Reliability Engineering (SRE) manual for more information about service level terminology. Your first workshop should not last longer than one and half hours and should focus on creating some initial results. Iterate these first SLIs over time and adjust your team’s practices as needed. Run the workshop as a whiteboard exercise to capture and focus your team’s view on your service. Doing this will generate a discussion about what’s important to your users. Prioritise your most important user journeys. Define what good means to users. Map out high-level system components. Observe and iterate your SLIs. People use your service to complete user journeys to achieve specific outcomes. Define your most important user journeys. For example, in Digital MarketPlace the most important user journey is where suppliers submit their bids. Your team will surface many user outcomes so prioritise 2 to 3 items to start with. Your product manager should lead your team in mapping your service’s user journeys, starting with the most important. Define what “good” looks like for your service from your users perspective. For example, if you’re hosting a web service, “good” means your web service is “available” and “fast”. If your service provides a type of publishing platform, “good” can mean how fast your service publishes data to live (data freshness). A technical person in your team, like a developer or site reliability engineer (SRE), should draw a high-level system diagram for your service. The diagram should show the major system components for each user journey. This could include only 2 or 3 components, or multiple system-to-system interactions including 3rd party software providers. Define potential SLIs and identify points in your service where you can measure them. These SLIs must reflect your user’s definition of good. Technical members of your team should contribute to where, how and what metrics they collect. These metrics will form your SLIs. Mark out your SLIs over a period of time, for example, a moving hourly window where your SLIs show system performance for the previous hour. Your team’s product or technical lead(s) seperate down your SLIs into tasks, for example using Trello, Pivotal Tracker or Jira Software. Some teams create an Agile epic to cover every task needed to carry out their SLIs and SLOs. After creating your SLIs, observe them over a period of time (for example 1 week). After this time, iterate your SLIs to better understand your service’s performance and how the SLIs help your team make decisions. The Observe team organised a workshop in the form of a whiteboard exercise with their product manager, tech lead and technical architect to identify their first set of SLIs. The team developed SLIs for the most important user journey: “Knowing how their service performs (by viewing a dashboard)”. The team mapped the user journey for “choose a Grafana dashboard”. 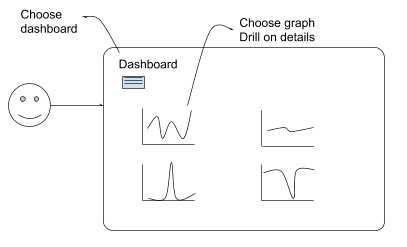 Users look at a Grafana dashboard to get a general understanding of system performance and then focus on individual graphs using the time axis to debug live issues. A user views a Grafana dashboard on their computer. The computer fetches data from a Grafana server running on GOV.UK PaaS. The Grafana server fetches data from a Prometheus database. The team created 2 related stories using Trello to gather metrics, displaying the SLIs on Grafana dashboards. The team has refined the percentage of successful requests responded within 2.5s to better reflect service status. Contact Reliability Engineering for more information about running an SLI workshop by email using reliability-engineering-tools-team@digital.cabinet-office.gov.uk or the #reliability-eng Slack channel. This page was last reviewed on 19 December 2018. It needs to be reviewed again on 19 June 2019 by the page owner #gds-way . This page was set to be reviewed before 19 June 2019 by the page owner #gds-way. This might mean the content is out of date.